Yes I have officially finished the class portion of the CreateASkate program. I am now ready to take the online test. 1. What type of wood is most commonly used in the manufacture of skateboards? 2. Where do the trees grow that are used in skateboards? 3. Typically, how old are the trees when harvested for skateboard use? 4. In the video production Ryan Sheckler ollies off a handrail onto a force plate. How many times his body weight was the force when he landed on the force plate? 5. Not bending your knees when ‘landing’ a skateboard trick can result in…? 6. How many plies (layers) of wood are in a typical skateboard? 7. Why is a ‘sealer’ coat applied to skateboards? 8. What is a skateboard’s wheelbase? 9. When comparing shorter wheelbases to longer wheelbases, the shorter wheelbase will turn___________ than a longer wheelbase. 10. 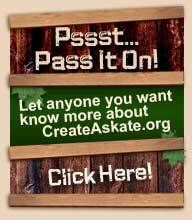 What are the numbers for the different grits of sandpaper used in the CreateAskate.org program? Congratulations, you’ve finished the test! To see if you passed just click below.